It has come to my attention that Lavatools mistakenly shipped normal Javelin thermometers to me, not the Javelin PRO models that I was supposed to review. As such, I have edited my review to reflect this. Accurate temperature reading are an absolute must for serious homebrewers, as variances of even a few degrees Fahrenheit can make huge differences in wort fermentability and the final mouthfeel of a beer. Let us all observe a moment of silence for that glass floating thermometer that comes with so many starter sets. 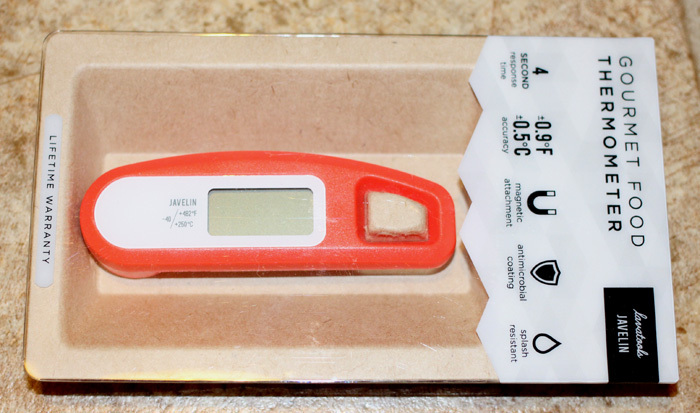 While we may keep it around for fun, one of the first pieces of gear that gets upgraded by the typical homebrewer is that thermometer, as traditional thermometers like this are often neither particularly accurate nor quick (or easy) to read. And, of course, they are made of glass - making them susceptible to death by fall. It seems like there is a wide range of very affordable digital thermometers for sale, but if you want serious accuracy and super fast read times, there is only one big name on the market - the Thermoworks Thermapen. Now, don't get me wrong; I received a Thermapen for my birthday a couple of years ago, and I love it. If I'm being perfectly honest, the "bling" factor of having a real top of the line piece of gear probably factors into my feelings, but being able to pull a dead accurate reading in an near instant manner is pretty great. Having a great digital thermometer has not only improved my brewing, but has revolutionized my grilling (especially in being able to nail proper steak doneness). I have checked the calibration of my Thermapen a couple of times, and have never needed to adjust it whatsoever. With that said, many brewers just cannot justify the $96 price tag that the Thermapen commands... not when there are several reliable digital thermometers that are nearly as accurate as the Thermapen, give readings in just a few seconds, and typically cost somewhere in the $15-$25 price range. After all, if you are happy with your thermometer, should you really spend four times as much to save three seconds and get a fraction of a degree more accuracy? Still, I've continued to love my Thermapen, but I have wondered for some time why nobody has tried to fill what feels like a pretty obvious niche to me. Surely, some company could create a thermometer close to the quality of the Thermapen, yet manage to fall somewhere between those $25 and $96 price points. 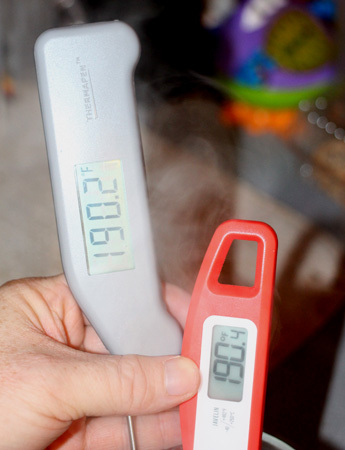 A couple of weeks ago, I was contacted by Ben from Lavatools, who wanted to know if I would be interested in reviewing the new Javelin PRO digital thermometer. He shot some stats at me, and almost all of them line up toe to toe with the Thermapen. However, the Javelin PRO has one huge advantage - it promises true top end functionality at a mere suggested retail of $58 (and the Amazon link I provided has it for $55). I was absolutely intrigued, so I agreed to do a review of the thermometer. Full disclosure: as mentioned above, this thermometer was provided to me at no cost. In addition, Lavatools has agreed to sponsor the 2015 BrewUnited Challenge by donating three thermometers for prizes, and have further agreed to sponsor BrewUnited by donating another three thermometers to be given away. With that said, the following review is 100% true and accurate, and is in my own words. Lavatools did not suggest any portion of, edit, or even read my review prior to my public post. First off, I'm including some device specifications from the respective manufacturers. So, the Javelin PRO claims to be slightly lighter and have twice the battery life. The Thermapen claims slightly better accuracy and response times, as well as wider measuring and operation temperature ranges - though, to be honest, those wider ranges are well outside of normal brewing applications. Like the Thermapen, the Javelin PRO stores in a folded position; unfolding the probe turns the thermometer on, and both have auto shutoff features in case you forget and leave the device open/on. The unfolding action was smoother and easier in the Javelin PRO than in my Thermapen. 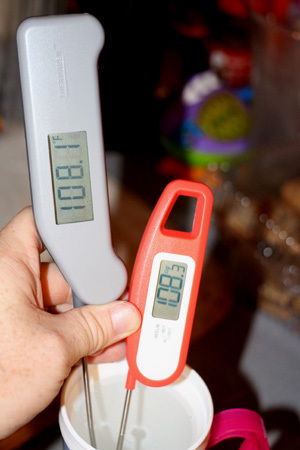 The Javelin PRO is noticeably smaller than the Thermapen, and is a bit lighter. It fits comfortably in a pocket, which is not always the case with the Thermapen, and its probe folds up into the back of the body, which prevents one annoying issue that I have with the Thermapen - namely, that the probe will get hung inside of my pocket. The Javelin PRO does feature a magnet in the back of the body, which was strong enough to hang the thermometer on my fridge (though just barely). Still, this is a convenient feature; it's a nice way to keep the thermometer at hand without it being in the way. However, the smaller overall size of the Javelin PRO means that it has a shorter probe than does the Thermapen. This was a small minus in my book, particularly when I went to measure boiling water, as I'd prefer to keep my hand further from the steam. I noticed that the Javelin PRO measured the air temps a good degree or so off of my Thermapen, and the display seemed to "dance" a bit - the readings would fluctuate a full degree plus or minus, while my Thermapen would settle in and stay within a couple of tenths of the reading. However, the digital reading area itself was about the same size as the Thermapen, and was every bit as easy to read. I decided to go run each thermometer through three tests - ice water, hot tap water, and boiling water from the stove. As soon as I started, I discovered that administering these tests would be a bit challenging. For the most accuracy, I wanted to be sure to use both thermometers in the same liquids at the same time. To do this - and get pictures of the process - meant that I would have to hold the thermometers in one hand, while trying to focus the camera with the other. Please forgive any potato quality in my photo efforts. Of the three tests, this was the most difficult to get the two thermometers to agree upon - largely due to the fact that moving a probe directly against a piece of ice will result in a slightly different reading than holding the probe in a nice pocket of water. Add a second probe (of a different length) in the same hand, and the process gets a bit tricky. However, as you can see, I got the two devices to agree within three tenths of a degree F. The Thermapen stabilizied at an exact 33°F, while the Javelin PRO stopped at 32.7°F. 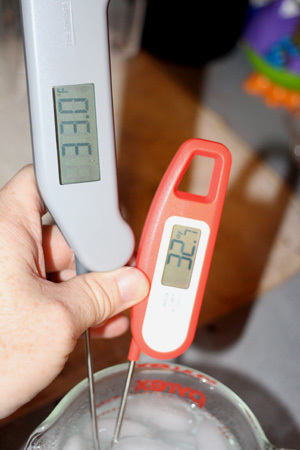 The Thermapen was ever so slightly faster to stabilize, though the difference was probably no more than a half second. This test was the simplest to administer, as I had no ice or steam to contend with. The final readings were two tenths of a degree apart; the Thermapen read 108.1°F, while the Javelin PRO showed 108.3°F. Once again, the Javelin PRO took slightly longer to stabilize, though it seemed quicker than with the ice water. Technically, I did not end up measuring boiling water, as the steam cooked my fingers while I tried to hold the thermometers into the pot on my stove for a picture - and, naturally, the steam blocked the camera focus, anyway. I ended up dumping the ice water out of my measuring cup and replacing it with my boiling water, which of course dropped the temp a bit. 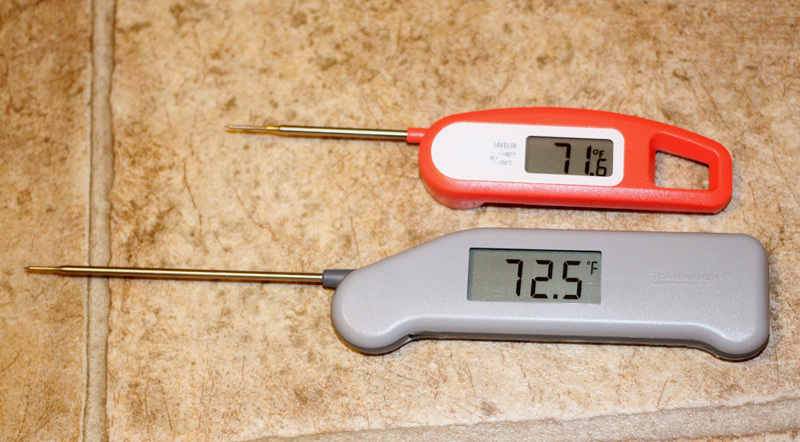 As you can see, the two devices were once again a mere two tenths of a degree F apart - the Thermapen read 190.2°F, and the Javelin PRO showed 190.4°F. This was the slowest reading I took for both devices, though it took the Javelin a bit over a second longer than the Thermapen to stabilize. I believe that the Lavatools Javelin PRO is a really nice piece of gear, and is very comparable, performance wise, to the Thermoworks Thermapen. It does not feel quite as substantial in my hand, but it has some nice features (portability, magnet on the back), and the readings appear to be very accurate - it always stabilized within three tenths of a degree of the reading I got from the Thermapen. The readings were slightly slower to stabilize than those I got from my Thermapen, but in almost every case, we were talking about less than a second slower. Considering that the Javelin PRO retails for just over half the price of a Thermapen - $58 for the Javelin PRO compared to $96 for the Thermapen - I'd have to say that there is a serious new contender in the digital thermometer market. Edit - seeing as how I reviewed the normal Javelin thermometer - which retails for $25 at Amazon, instead of $55 - I would have to say that the performance was an even better bang for your buck! The RT600C also meets this spec. Yeah, Chino - I saw a guy on reddit commented that he dropped his Javelin in the mash tun, but that it floated, and he was able to get it out with no harm done.